THE TROUBLED SPIDER-MAN Broadway production has hit yet another snag it seems, after a leading lady was concussed after being hit on the head backstage. Natalie Mendoza, who plays villain Arcahne, was reportedly struck across the head with a weighted rope that was holding a piece of equipment while standing backstage. She was unaware that she was concussed and participated in the next performance against the doctor’s orders. Mendoza will be replaced by an understudy until next week. Spider-man: Turn Off the Dark is being directed by Julie Taymor, and the score is being produced by Bono and the Edge. The show has been several years in the making and has run into a myriad of problems, including delays, injuries, faulty set pieces, and financial difficulties since the beginning. On the opening preview night, Mendoza was helplessly suspended above the crowd (along with leading man Reeve Carney) in flying stunts that went wrong. Audience members said that the preview show stopped five times and ran for more than three hours. Last month, an actor and a dancer also suffered broken bones while attempting to do the sling-shot flying technique. Kevin Aubin broke both his wrists while attempting to do the sling-shot flying technique that made Spider-man famous, while a dancer broke his ankles during rehearsal. Unfortunately with shows with a lot of elaborate stunts such as this, there are accidents – especially during the rehearsal time. We’re just glad nobody’s injuries were any worse, and hopefully by the time it debuts all of the kinks will be worked out! And to, literally, add insult to injury the show itself is being slated by critics, who have said the storyline is dull and complicated – although the producers have another month until it officially opens. Let’s hope they iron out the kinks; costing $65 million, the show is the most expensive show in Broadway history. 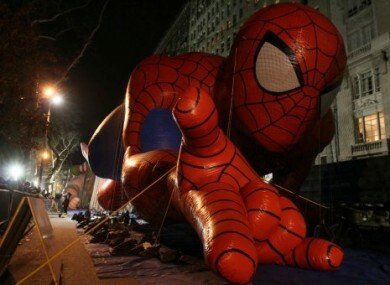 Email “The curse of Spider-man: Broadway show hits another snag”. Feedback on “The curse of Spider-man: Broadway show hits another snag”.